Quickly determine the most reasonable way to protect your own life. 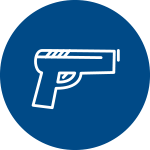 Remember that students and visitors are likely to follow the lead of faculty and staff during an active shooter situation. If you cannot speak, leave the line open and allow the dispatcher to listen in. Law enforcement’s purpose is to stop the active shooter as soon as possible. When officers first arrive, they will proceed directly to the area in which the last shots were heard.